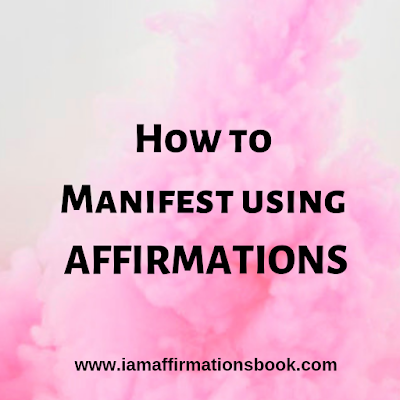 The Use of Affirmations is a powerful tool to imprint your Subconscious Mind and play with the energy of Universe. Affirmations are positive statements and ideas we repeat over and over again to imprint your subconscious mind. When we affirm something its like we are informing the Universe that we are ready for a new belief and reality. Universe is here to grant all our wishes we just need to place the order, now its up to you what order you wish to place. Your beliefs create your reality. So when you believe you don't deserve love, Universe accepts the order and will never deliver you love. Also when you believe you deserve money, health and wealth, Universe accepts the order and delivers the same. Everything you see around you is a manifestation of a thought/idea. Whatever we create and manifest it first comes as a thought/idea in our mind and the quality of the manifestation depends on the quality of the thought/idea. A Positive thought creates a Positive Reality and off course visa versa. STEP 1 - Think of what you wish to manifest in your life. It doesn't necessarily have to be a person or a thing, it can also be a new habit, a new hobby or a new pattern. Choose and be specific on what you wish to create. You can be as specific as you want. Be creative. See and feel what feels right to you. Now make sure you repeat these statements to yourself in the morning, at night or the entire day, so it gets deeply ingrained in your Subconscious Mind. Our subconscious is the Power House. It is the support system through which our Conscious Mind brings our desires into manifestation. Without the subconscious no desire can manifest. Our subconscious holds all the creative powers of the Universe. Affirmation is a simple yet effective tool to bring all your dreams and wishes into reality. Happy Manifestation. So what are you creating currently ? Do let me know .